It's hard to overstate the shock astronomers felt when the true nature of quasars began to dawn on them in the early 1960s. At first, these mysterious objects seemed like ordinary stars, tucked in the embrace of our familiar Milky Way. But a closer look revealed that they were billions of light-years away, far beyond the confines of our galaxy. To be visible at such vast distances, a quasar must, by itself, have been as bright as an entire galaxy, but somehow squeezed into a pinpoint of light  and nobody knew how such a thing could be possible. It took a while, but theorists finally agreed that quasars are really giant black holes that lurk in the cores of distant galaxies, sucking in surrounding gases and heating them until they shine halfway across the universe. Meanwhile, in the decades since those first, startling discoveries, scientists have boosted the number of known quasars from a tiny handful to some 200,000 across the sky. But while quasars are pretty common nowadays, the newest one, reported in the latest issue of Nature, is still a big deal. It's by far the most distant quasar ever discovered, so far away that its light has been en route to Earthly telescopes for 12.9 billion years. That means this remarkable object, with the unremarkable name ULASJ1120+0641, is sending us light from a mere 770 million years after the Big Bang itself. That alone would be significant if you were looking to score an entry in the Guinness Book of World Records. But the new object is far more important than that. 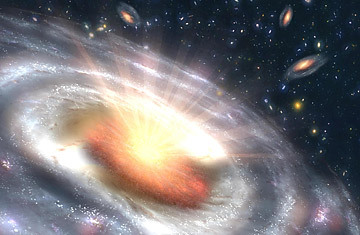 For one thing, writes Chris Willott, of the Canadian Astronomy Data Centre in a Nature commentary, "The quasar is a monster." Indeed it is, weighing in at 2 billion times the mass of the Sun. What makes such a big body even more improbable is that it seems to come along too early in the history of the universe to make sense. Says Avi Loeb, a theorist at the Harvard-Smithsonian Center for Astrophysics: "It's difficult to make a black hole this huge so quickly after the Big Bang." Difficult, but not impossible, says Loeb. Ordinary black holes are created when massive stars run out of fuel and collapse; giant black holes grow from these original seeds, by swallowing gas, or merging with other black holes, or both. That process takes time, however, and the enormous energy that streams outward from the hot, compressed gas in the form of light and other forms of radiation can makes it hard for more gas to fall in quickly. But it's quite possible that the very earliest stars were bigger than anything that exists today  a million times the mass of our Sun. "That could give the process a jump-start," Loeb says, especially if many black holes of this size merged. He also points out that black holes can swallow both matter and radiation, so the problem of rapid growth might not be such a problem. In short, argues Loeb, the existence of a black hole this big and this early "doesn't violate the laws of physics, even if we don't fully understand how it happens." No matter how ULASJ1120+0641 came to be, astronomers are grateful for its presence because it allows them to probe further back in time than they ever have before. Strictly speaking, a couple of galaxies, and a short-lived phenomenon known as a gamma-ray burst have been seen from an even earlier era, but the galaxies are quite dim and the bursts didn't last long enough to be studied in great detail. Quasars, however, shine brightly and more or less steadily, and the nature of that ancient beacon can tell an important tale. On its way to us, a quasar's light is subtly altered by the diffuse gas pervading the cosmos. In general, we know that the very early universe was mostly hydrogen, and in a form that absorbs light very efficiently. In fact, the several hundred million years following the Big Bang are known as the Dark Ages because of the shrouding effect of all that hydrogen. Ultraviolet radiation from the very first stars cleared out the hydrogen  but exactly when and how this happened is still unknown. This new quasar, though, appears to date from a time when the clearing process wasn't yet complete. Assuming there isn't a dim galaxy sitting right in front of the quasar and confusing things, says Loeb, it looks as though about 50% of the hydrogen has been dissipated. To be really confident about that, observers will have to find more quasars from this era. And that, says Daniel Mortlock, of Imperial College London, the Nature paper's lead author, is just what he and his colleagues are trying to do. ULASJ1120+0641 was found in a survey that will ultimately cover a tenth of the sky, and, he says, "this quasar comes from the first half to two-thirds of the data." Even when the survey is complete, that will leave some 90% of the sky left to search for quasars not just at this precise moment on the cosmic timeline, but also slightly earlier and slightly later. Those should provide even more clues about how quickly the intergalactic hydrogen was blown away. It's a measure of the richness of the cosmos that quasars, which were once the most mysterious objects in the universe, are now some of the most useful implements in astronomer's toolboxes. It's a measure of the smarts of those astronomers themselves that that journey has taken just two generations.